LAKEWOOD, FL (KTRK) -- This adorable photo of a police officer and a puppy that he almost ran over is going viral. According to a Facebook post by the city of Lakeland, Florida, Officer Kareem Garibaldi found a puppy hiding beneath his car while working the night shift. The officer drove around, searched for her owners and ended up naming the puppy Hope. He brought the puppy back and posted pictures on social media sites. After a long search and a 12 hour shift, Officer Garibaldi, transported the dog to the SPCA to be checked out. 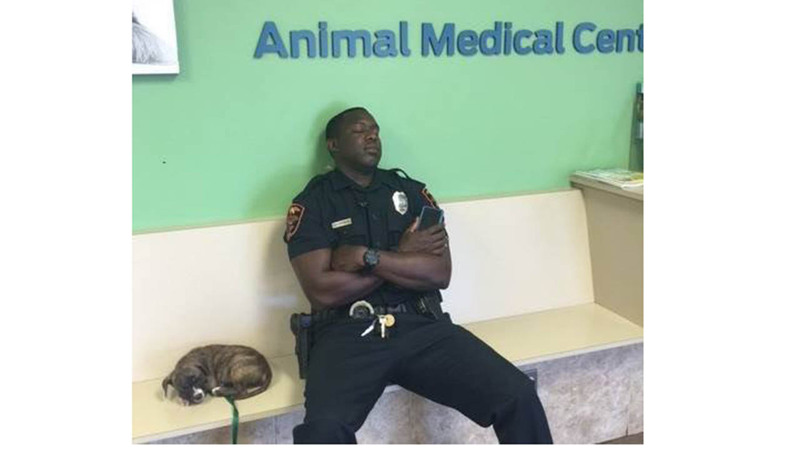 According to the post, the officer sat there from 8:45am to 12:00 p.m. as the vet checked the puppy out when this picture was taken and posted to Twitter. A wonderful update, the puppy found a new home.